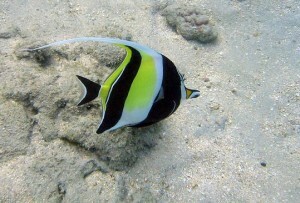 Bob Fenner wrote an interesting article, posted on Fishchannel.com , about keeping the Moorish Idol, Zanclus cornutus, in captivity. Bob presents some helpful advice on keeping the fish. For one thing, he mentions that the fish are found mostly in pairs in the wild–and therefore recommends that aquarists interested in keeping these fish also attempt to keep them in pairs. 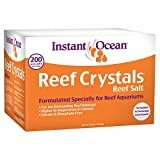 Bob recommends keeping them in established, reef quality, very large tanks with non-boisterous tankmates and plenty of room to retreat and hide. He reports observing successful specimens fed a pellet diet, but encourages a range of foods, including sponges, which make up a significant portion of their diet in the wild. The article has the potential to spark a healthy debate–because the survival rate is so low with these fish, one could make a very sound argument against attempting to keep the fish at all. Articles like this (and my article too, I suppose) may only fan the flames of consumer demand and therefore cause more Moorish Idols to be taken out of the wild and shipped in styrofoam to their imminent death. On the flip side, if people like Bob don’t help us to keep pushing the limits of what we know and can accomplish in this hobby, the hobby would stagnate. If we look back at the origins of the saltwater aquarium hobby, many fish that are common today suffered unbearable mortality rates in captivity. Who knows, maybe someday we will look back and wonder why we had so much trouble rearing these fish at all. But one thing is for sure–if we don’t advance the body of knowledge we have about keeping these fish in captivity, we never will improve those mortality rates. And because of that, I commend Bob for putting some helpful advice together to help build the knowledge base for these fish. Don’t take my word for it, check out the full article by Bob about keeping the Moorish Idol, but come back and let me know what you think. Have you ever tried to keep the Moorish Idol? Do you think we should ban the importation, since they suffer such a high mortality rate? Want to have updated articles, tips and information sent to your email? Use the widget on the right side to submit your email and sign up for the Saltwater Aquarium Blog Newsletter. Have you ever tried to keep the Moorish Idol or another notoriously difficult fish/coral to keep?